If you are one of those lucky people who never gets breakouts, then you can just skip right over this post. As for me, not only is my face falling in, it is also breaking out. I naively assumed that once I was on the other side of forty, I’d be immune to breakouts. Wrinkles, yes of course. But breakouts? No. Unfortunately, I am still prone to all kinds of eruptions: the hormonal ones around my chin and jawline, the really obvious and impossible-to-conceal ones on my nose and forehead, as well as the rash-like ones on my cheeks which I am currently plagued with. I’m including a photo of me this morning with no makeup because those of you who know me IRL will find it hard to believe my skin gets *this* horrible. Summertime makes my breakouts worse since my skin is more reactive in warm weather, so I thought this would be a good time to get my best tips and tricks posted on the Sequinist, in case it helps anyone else who, like me, is sometimes cursed with midlife spots. My routine is three simple steps: Exfoliate, Obliterate, and Medicate. I go from spotty to clear in three days doing this. EXFOLIATE: After thoroughly cleansing, exfoliate the hell out of your skin daily… but gently. These are my four best tried-and-tested exfoliators. 1. My strongest exfoliator is the aspirin mask (if you have been under a rock for the last 20 years and don’t know this trick, here it is: dissolve a couple of plain aspirins in a teaspoon of water to make a thin paste, spread this all over your face, and lie down for 10 minutes while the salicylic acid in the aspirin eats through the dead skin cells on the top layer of your skin. Try to keep it out of your nostrils or you’ll sneeze, and try to keep it out of your eyes or you’ll cry. If you don’t have sensitive skin, you can re-wet your hands and scrub a little, but be gentle, as the aspirin grains are fairly coarse. Rinse off). 2. I swear by the Dr Dennis Gross Alpha Beta face peel, a two step process. Wipe the first moistened pad on your face, avoiding the eye area, wait two minutes, and then wipe the second moistened pad on your face. You’re done. The first treatment pad contains glycolic acid, salicylic acid, citric acid, lactic acid, and malic acid, all of which chow through dead skin. The second treatment pad neutralises the acids and treats your skin to a little bit of Vitamins C, E and some Resveratrol. I’ve been using this product for fifteen years. I love it. 3. My third option for exfoliation is a physical exfoliant, Remede’s Sweep. No acid here; Instead, it has white marble powder grains that do a gentle job of exfoliating, along with some healing bentonite clay. This has been a best-seller for nearly twenty years for a reason; it is super gentle, and yet it works. 4. My fourth exfoliation recommendation is the (badly named) Dermalogica gentle cream exfoliant. This ‘cream’ has lactic acid and hydroxy acid in it, which eats away all the stuff you don’t want on the surface of your skin. I’ve even slept with this on overnight during particularly heinous breakouts. Also, be aware that despite this being called a ‘cream exfoliant’ there is nothing remotely creamy about it; it is the same texture as toothpaste or a clay mask. This one sometimes stings a little, but I don’t care because it works brilliantly. OBLITERATE: Now that your skin is nicely exfoliated and prepped, you can treat those offending spots. 1. Persagel 10%. 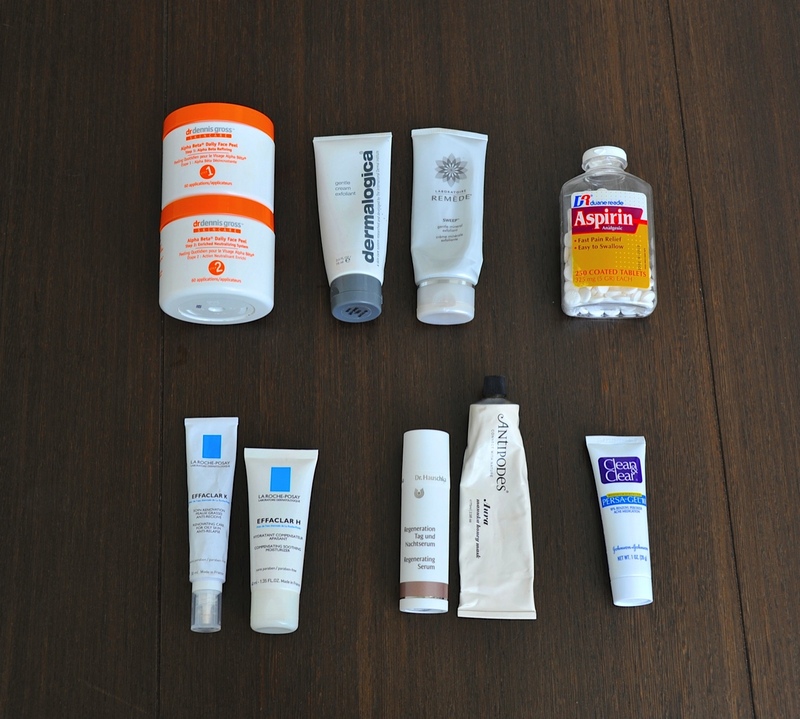 This is tricky and harsh on older skin, so here is how to use it. At night, only put a tiny dot on the very centre of each spot, no matter how big or small it is. Don’t cover big swathes of skin, or you’re just going to end up with red flaky skin AND pimples. If I have a rashy breakout, I get my magnifying mirror out, and use a tiny eyeliner brush to paint a little dot of Persagel onto the centre of each spot before going to bed. Yes really. Now here’s the controversial part. I know some of you will scream in horror when you hear this. It works for me, and my skin shows no ill effects. If I get impatient with a spot, I sterilise a small pin, lightly break the surface of the spot (not a deep puncture, not a long scratch) and put the Persagel JUST on the centre, so that it can get in to dry out and obliterate the junk inside the spot. My weapon of choice is a tiny safety pin from a clothing hangtag, sterilised with alcohol. Scream all you like, it works. 2. 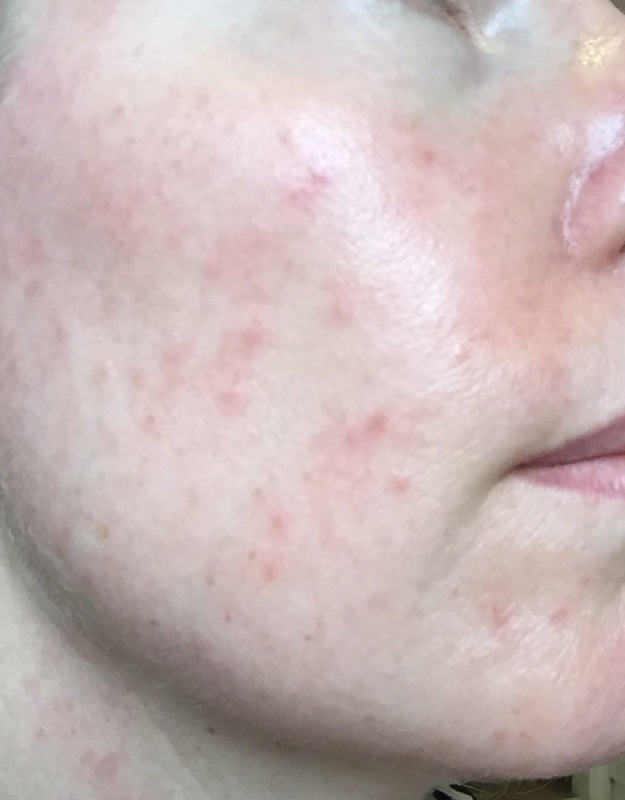 In the daytime, I can’t walk around with white pointillist Persagel spots all over my rashy face, so I use La Roche-Posay Effaklar K on the problem areas. It has our old favourite salicylic acid in it as well as sodium hydroxide (aka, lye) and a few other fairly nasty ingredients, so I don’t use this unless I really need it. It smells a little medicinal and chemically, but desperate times call for desperate measures, and this stuff is nothing short of miraculous. The packaging says “renovating care for oily skin, anti-relapse” and boasts being an “excellent make-up base”. It is a cracker of a product, and I wish I’d known about it years ago. MEDICATE: After the battle, we have to clean up the wreckage and make repairs. 1. La Roche-Posay Effaklar H is another genius product. It is a “compensating, soothing, moisturiser” specifically created for skin “made fragile by over-drying skincare.” Is that brilliant or what? If you walk into a French pharmacy, and tell them your skin is a shrivelled wreck after a bad breakout and what do they have to address that problem, this is what you are offered. After I’ve exfoliated and obliterated day and night for three days, Effaklar H helps restore some peace to my product-ravaged face, and like its alphabet sister Effaklar K, it actually does exactly what it says it will do on the label. 2. Whether my 45 year old skin has been good or bad, I treat it as often as I can to Dr Hauschka Regenerating Serum. I love almost everything in the Dr Hauschka range (except their makeup products, which I’m not a fan of) but this is their star product in my opinion. Yes, it is expensive, but my skin adores it. I bought it after reading rave reviews online, and I think I must be on my 6th bottle by now. It is meant to be a firming product for older skin, but it is also extremely soothing and calming, which is much needed after my breakout-solving regime. 3. In addition to the Dr Hauschka Serum, Antipodes Aura Manuka Honey Mask is an effective product for hydrating and adding lots of moisture back to my skin, without clogging pores or irritating it with perfumes. I was given this as a free sample and have repeat purchased it three times now. The only dietary adjustment that helps my breakouts is lemon juice. I juice a whole lemon at breakfast, one at midday, and one later on in the afternoon and add it to a glass of water. I don’t know why lemon works well to help my skin recover (other than that it is alkalinising in the body, despite being an acid, and is considered ‘anti-inflammatory’), but it definitely does. Let me know in the comments below if you’ve tried any of these products, or if you have any of your own tricks to share, please do! Gosh, poor you, that’s not fun at all. Since I’m menopausal I only break out when I overdo on oestrogen (which is what happened last week). So in my case it’s always hormonal. But then I use the progesterone cream and it goes back to normal. Otherwise I love all DR Hauschka products, so I’d be happy to try. I’m also crazy about all things Hausckha and Weleda, Abby. I usually use only really natural products on my skin… until the breakouts happen, and then I switch to full-on toxic chemicals to exterminate them, lol! I hope I won’t go through this. I’m just a little younger than you but my skin has been clear these past fifteen years. This is what I needed! Not sure how I missed it. Thanks so much for all this info – will be trying some of these methods out and see what happens. I am older than you and have been finished with the menopause for a few years – my breakouts changed from being proper pimples to annoying unsightly red blotches that just suddenly appear. And by the way, when I did get pimples, I found giving up all dairy products stopped the bad ones (the ones that needed squeezing yuk!). If I ate cheese, I would get horrible painful spots that would come to a head but I never had another one after I stopped eating dairy. I can eat a little yoghurt but that is it. No milk or cheese at all. Crazy as it may seem to add grease to the equation I pop a tiny smudge of lanolin on spots. It prevents any flakiness from the benzyl peroxide and I think speeds up healing.